The driver was arrested on charges of trading the protected species and claimed that he was paid less than $50 to transport the snakes. All 53 snakes were stored in green cloth sacks and could have been intended to be killed for their meat or for traditional medicine. They will be released back into the wild after they are inspected by a local wildlife center. 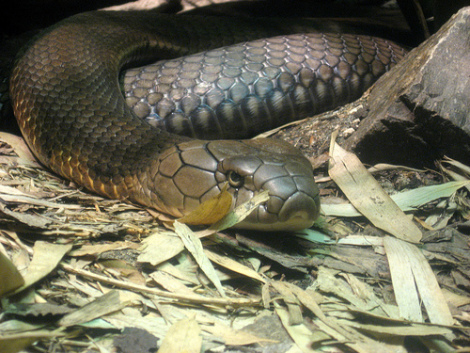 King cobras are the largest venomous snake species on the planet and they can grow to a length of around 18 feet. Native to southeast Asia, king cobras survive on a diet mostly composed of other snakes, including both venomous and nonvenomous species. Shake It, Cuban Pete! The Smooth Dancing Animal Video Of The Day!!! So... What's Up With This Whole Cloning Mammoths Thing? The Animal Video of the Day!!! Houdini Horse! The Escape Artist Animal Video of the Day!!! Could Peter Venkman Be Correct? Is This the End of Days? The Dog and Cat Living Together Animal Video of the Day!! !